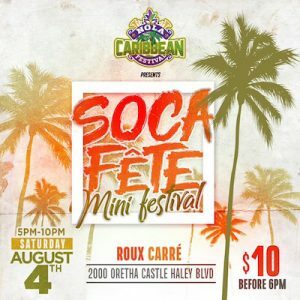 Their Soca Fête Mini Festival will feature top Caribbean DJs, New Orleans DJ Raj Smoove, and international Soca artist Imani Ray. The event is set for Saturday, August 4, from 5 to 10 p.m. at Roux Carré, 2000 Oretha Castle Haley Blvd. In addition to Trinidadian food and Caribbean drinks, the festival will also feature eight arts & crafts vendors. General Admission tickets are $10. Advanced tickets, additional information, updates and offers are available at nolacaribbeanfestival.com.